JACKSON, Tenn. — A man injured in a shooting early Monday morning at a Jackson bar has died. Braxton Watkins, 20, of Jackson was pronounced dead at 10:15 a.m. Monday, according to the Jackson Police Department. 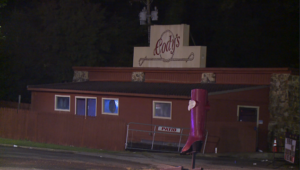 Police are asking for the public’s assistance as they investigate the shooting that took place around 2 a.m. Monday at Cody’s on Heritage Square. Five people were injured in the shooting, including Watkins. “There was around 200 people in here. This happened about 10 minutes before closing, which is at 3:00,” Jackson Police Department Capt. Jeff Shepard said. Police are now asking anyone who was in the bar or may know what happened at the time of the shooting to call Jackson police or Crime Stoppers. “Just anybody that was here that saw what happened, you know, contact us, and we’ll be glad to take a statement from you,” Shepard said. Cody’s released a statement Monday afternoon on their Facebook page. Jackson police have not confirmed a motive for the shooting or released any suspect information. Jackson police are urging anyone who witnessed the shooting to contact the Jackson Police Department at 731-425-8400 or Crime Stoppers at 731-424-TIPS (8477). Watkins’ body has been transported to Nashville for an autopsy. Police say the autopsy should be complete Tuesday. Police have not confirmed the extent of the injuries for the four other victims.